This 2-Disc set gives you everything you need to get off the ‘prove yourself’ treadmill and into the ‘be yourself’ winners circle using The Zone Method. Get the same tips utilized by Fortune 500 leaders and people just like YOU who are ready to stop doing more and start being more everywhere you go. 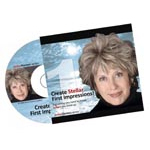 Get Fran's stellarStarters™ e-newsletter every Monday to jumpstart your week and create stellarBeginnings™. © 2019 Zone Communication. All rights reserved.